Love is meant to endure. Shouldn’t the present you give to express your love do the same thing? Chocolate is delicious but it will soon be eaten and forgotten (unless it has added unwanted pounds). Flowers are beautiful but before long, they will wilt and be thrown away (unless you gave artificial flowers which would be the wrong way to express your genuine affection). OMEGA has some proposals for gifts which will last well beyond this Valentine’s Day. And the next. And the one after that. And the one after that. he will love his De Ville 4-Counters Co-Axial Chronograph with its four sub-dials dramatically spread across the face of the watch. In a staggered row, from left to right, they feature the small seconds, a seven-day counter, the 12-hour counter and the 30-minute counter. Just above the centre of the watch is a window which shows the day of the week. Like the Ladies’ De Ville Co-Axial Chronograph, this COSC-certified chronometer is at once sporty and elegant. 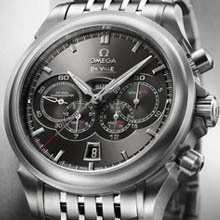 Make this Valentine’s Day one to remember with an OMEGA De Ville Co-Axial Chronograph. It will still be expressing your feelings next Valentine’s Day (we can’t say the same about the flowers and the chocolate).